Yes, you do need another hi-cap polymer handgun. Yes, you do need another hi-cap polymer handgun. And this is the one. Here’s why: This gun will be the one you plink all day with, the one you use to introduce a newbie to the world of shooting, and the one you humble all your friends with in a target shooting competition. Chambered in .22LR, it weighs under 20 oz. loaded, holds 16+1 rounds, and retails for $349. Even better, it feels great in hand and shoots almost effortlessly. And best of all, you’ll have a smile on your face before, during and after you shoot it. In fact, it’ll be love at first sight. 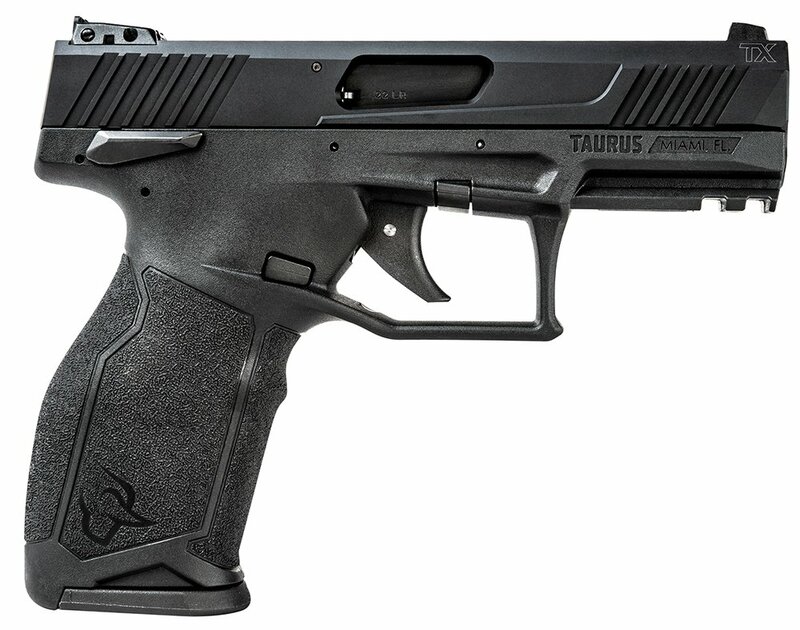 The Taurus TX22 is a thoroughly modern rendition of the traditional plinker. Chambered in .22LR and offering excellent ergonomics and a super smooth trigger ... let's just say you'll love it. Image courtesy of Taurus. I’ll give you some additional specs and a little more info behind all the engineering in just a bit. First, let me give you some additional insight into my initial experience with the gun. I picked up the TX22 at my FFL, a local gun store and range, and marched right out to the range to shoot it. The gun was covered in packing oil but I wiped off the excess with my winter cap, did a quick function check, loaded it up and fired away. No cleaning, no other prep. I put 100 rounds of ELEY .22LR through the gun in no time, alternating between the Target and Match versions of the ammo. I tried to be slow and deliberate but between the ease of loading, ease of shooting, and the perfect performance of feeding, firing, and ejecting spent brass, I blew through it all pretty quick. I had some help from the range officer, a veteran with 22 years of shooting experience in the military. He put about 32 of the rounds down range, ending with a big smile and this comment: “Now that’s a nice target shooting gun!” He tended to the duties of the range but kept coming back to my station to check it further and talk about it more. I think he was hooked. At the range, it took hardly any time at all to blow through 100 rounds of ammo. That's because TX22 is a hoot to shoot. And it's a hoot to shoot because everything about the gun — design, engineering, feel — works together seamlessly. Image courtesy of Taurus. To his point, it is a nice target shooting gun. Taurus says the TX22 was designed from top to bottom with the human factor in mind. So ergonomics — especially grip, trigger reach and controls — are all thoughtfully placed for maximum efficiency. The fire control assembly is a single-action only striker-fired system (the Taurus Pittman Trigger System, to be exact) and features a five-pound trigger pull that honestly feels more like four pounds or less. It’s smooth and offers a clear reset. TX22 sports numerous safety features including an optional ambidextrous, thumb-activated manual safety — 1911 style. My test gun had it and it was difficult to thumb the safety up/on, but easy to thumb it down/off. It also has a MIL-STD 1913 accessory rail and comes with a thread adaptor should you desire to suppress it. The magazine catch sits a bit higher than you think but is reversible if you prefer it on the other side. Yep, that's an ambi manual safety. And that magazine catch is reversible. And the grip angle is just right. Image courtesy of Taurus. Now, a couple more specs. At 7.06” overall length and 5.44” overall height, this is a duty-sized gun. The slide is made from 7075 aluminum, making it lightweight but strong — more than enough for .22 duties — and sporting a black hard coat anodized finish. Atop the slide sit the familiar three-dot sights. The polymer frame features a textured grip that was just right in terms of grip feel — good purchase without any abrasiveness. Overall, I’d say it has all the right features and all the right feel. I loved shooting it and would not have actively thought about all these specs unless I was writing a review of the gun. Two magazines come with the TX22. Not only do they hold 16 rounds each, but you can pull the followers down with your fingers to aid in loading fresh rounds. TX22 magazines hold 16 rounds of .22LR. And because you can pull the followers down, they load easy. Beware: This gun sort of makes you shoot fast. It'll take you just over three full magazines to go through a 50-round box of .22LR. Image courtesy of Taurus. One of the most difficult tasks for gun reviewers is to describe how a gun feels when we shoot it. Mainly we’re trying to describe what the recoil feels like. There’s recoil with the TX22, of course, but barely. The gun’s ergonomics, its excellent grip, and the recoil spring work in harmony to make recoil as manageable as any handgun. Think of the best target shooting .22LR handguns out there, subtract a good chunk of weight, add excellent ergonomics and a few other notable features and you’ll get close to what the Taurus TX22 is all about. Then try one at the range see for yourself. It’ll be love at first sight.